The Ford Transit van is a working class hero, particularly in Europe. The popular Transit has helped skilled tradesman, delivery drivers and taxi drivers earn a living since the mid 1960s and that’s just to name a few – if you can think of a blue collar profession, it probably involves a Transit in some shape or form. Not all versions of the simple Transit van are so humble, though. In the late 1960s, Ford was looking to boost the popularity of the then-new Transit van. Some mad person within the automaker’s trucks and commercial vehicle division then got the idea to stick the V8 race engine from the Ford GT40 Le Mans car in the back of the MK1 Transit and commissioned Terry Drury Racing to slap the thing together. According to the Terry Drury Racing’s website, the race team “had the floor pan cut open,” to make room for the bigger engine and bolted a rear tubular spaceframe in to carry the running gear. The van’s wheel housings were also extended to make room for 15-inch wide wheels with Firestone racing tires, which housed massive brakes plucked from a Can Am car. The GT40-powered Transit, dubbed the Supervan, was the first of many high-performance Transits Ford has built over the years. 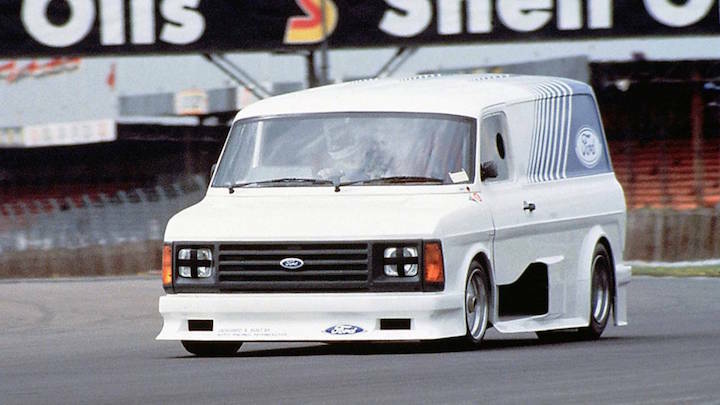 A second Supervan (above) was introduced in 1984 and featured a fiberglass replica shell of the MK2 Transit laid overtop of a Ford C100 Group C chassis. 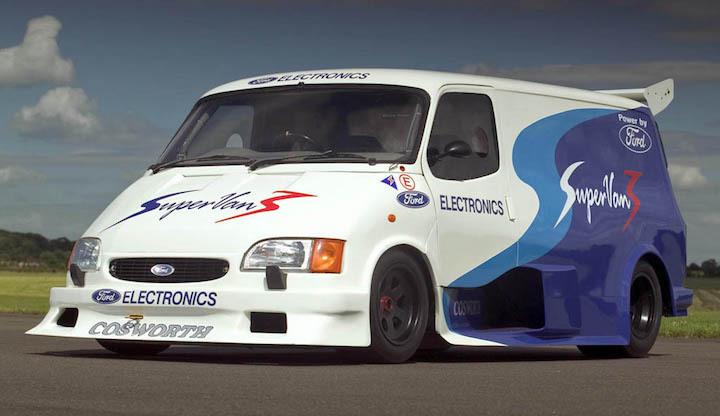 Powering this Supervan was the venerable Cosworth DFL V8 engine, which was originally developed for use in Formula 1. A third Transit Supervan then came along in the mid 1990s (below) with a restyled fiberglass bodyshell and an evolved version of the DFW V8 called the HB. Fast Ford vans remain a bit of a trend today, with numerous UK shops offering comprehensive tuning packages for the vans. YouTube car channel Carfection recently caught up with one of these tuners to sample a few of their vans and also provided a brief history on the Transit Supervan in the process. Check out the video embedded above – if you’re a lover a fast vans, you definitely won’t want to miss this one.